News, highlights, con lists and other interesting bits. How to get in touch with us OzFoxes! 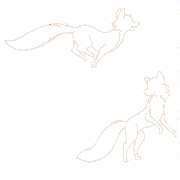 A basic FAQ page about vulpines. Limited edition fantasy convention prints for sale. Limited edition Faux Pas prints for sale. Limited edition wildlife prints for sale. Once upon a time, Faux Pas was once a book. Check it out. Order a copy of Marsha RedFox's\ cookbook online. "Teatime Treats" illustrated recipe prints. "Historic Treats" illustrated recipe prints for sale. "A Year From The Garden" illustrated recipe prints for sale. Fantasy, wildlife & Faux Pas Christmas cards for sale. Foxy T-Shirts for sale featuring art by us OzFoxes! Faux Pas online, a M-W-F comic, plus Art Secrets & links! An overview of the Faux Pas universe. The online day-by-day archive of Faux Pas strips. The online week-based archive of Faux Pas strips. Tales of the ShadowWood graphic novel online, updated every Monday. The main link page for all our online art secrets. Our bio page - what it's like to be Fluffy. Weather, philosophy, and what the cats are doing. How to link to the FoxWeb, and other fun. Links to pages that are linked to the FoxWeb. Links to Web Rings we've joined. The Faux Pas Archives can be found on www.ozfoxes.net, hosted by Purrsia.com.